Eurostat released the latest national accounts data for the Eurozone yesterday (October 31, 2016) – Preliminary flash estimate for the third quarter of 2016 – which showed that real GDP grew by 0.3 per cent in the third-quarter 2016, unchanged from the second quarter and below the previous two quarters by 0.2 per cent. In this context, there was an interesting article in the latest ECB Research Bulletin (October 28, 2016) – The recovery of investment in the euro area in the aftermath of the great recession: how does it compare historically? – written by Philip Vermeulen, a senior economist at the central bank. I say interesting for two reasons: (a) the subject matter is inherently of interest; (b) the manner in which the article dodges around the obvious is a reflection of the institutional intellectual capture of the bank, even though the disclaimer is that the views expressed “do not necessarily represent the views of the European Central Bank and the Eurosystem”. 1. “In the aftermath of the Great Recession, investment in the United States has recovered, whereas investment in the euro area has remained low following the sovereign debt crisis which temporarily halted the recovery in the euro area” – note the causality being inferred – “the sovereign debt crisis” caused the problem. 2. “investment in the current cyclical phase is not unusual as such; rather, it is aggregate consumption that is growing more slowly than usual” – the claim is that the weak behaviour of investment is historically normal for the European nations but in the recent period, it is household consumption that is aberrant. So that represents two interesting propositions. … highlights the importance of policies aimed at stimulating aggregate demand. Again, I found this interesting but troubling. We know from historical experience that investment behaviour via the ‘accelerator’ process responds positively to higher expected economic growth, which results from higher expected aggregate demand (spending). Please see my blog – Investment and profits – for an explanation. Why does the author only think that consumption spending is sensitive to the overall state of spending and economic activity in the economy? The first point to extract from the article is that there is an understated admission that Quantitative Easing has failed and that monetary policy (adjusting interest rates) is a weak counter-cyclical tool. The European Central Bank’s very accommodative monetary policy stance directly acts as stimulus for investment by lowering the cost of capital and furthermore indirectly as a result of its impact on aggregate demand. Despite this stimulus, the euro area’s low level of investment might well appear disappointing. First, monetary policy is a very weak counter-cyclical tool (that is, a policy tool that can work against the non-government sector spending cycle). Lowering interest rates has ambiguous outcomes. While borrowers enjoy a net income boost, lenders enjoy an equal income loss. Distributional nuances then would determine the net outcome. So if borrowers, in general, had a higher propensity to consume than lenders, then it is possible that some minor stimulus in spending could occur. But even the central bank is unable to determine the net outcomes of those sort of nuances. Further, when pessimism is high, sales are low and unemployment is skyrocketing, a lower cost of borrowing is not going to induce people to seek further credit and spend up big. Overall, aggregate spending is relatively insensitive to interest-rate changes within normal ranges. One might suggest that the near zero interest rates that have persisted since the onset of the crisis are anything but normal. That is so, but just reflects the seriousness of the crisis and the deep pessimism within the non-government sector. Second, the blind faith that QE would act as a powerful counter-cyclical stimulus to spending was totally unfounded and is one of the most stark demonstrations of the failure of mainstream macroeconomics. It was believed that the ECB (and any central bank engaging in the practice) would immediately stimulate bank lending by giving them more reserves via the QE asset swap (reserves for bonds). This has been core neo-liberal theory – that bank lending is constrained by reserve availability. As I explained in this blog (early on in the saga) – Quantitative easing 101 – and later in the following blogs – Building bank reserves will not expand credit and Building bank reserves is not inflationary – bank lending is never so constrained. Banks do not lend reserves other than between themselves to cover shortfalls in the payment system (cheque clearing) requirements on day-to-day basis. Banks lend when there are credit-worthy customers willing to borrow and then manage their reserve positions after the fact to ensure they retain integrity within the payments system. The reason that credit access was so low in the aftermath of the GFC was that no one was willing to take on the risk of borrowing when economic activity was weak. While QE did reduce interest rates in the maturity ranges of the assets that the central banks were buying (because they bid up demand for the asset which drove down yields), the lower ‘investment’ rates were not sufficient to offset the pessimism within the non-government sector, that was already overburdened with debt as a result of the credit binge prior to the crisis. So how does he get to that conclusion after earlier discounting the monetary policy impact on investment in the Eurozone? He produces a graph that shows that “the decline in investment during the Great Recession was roughly comparable across the two monetary areas” (US and the Eurozone). So what went wrong in the Eurozone? The author claims it was the “the intensification of the euro area sovereign debt crisis in 2011” that brought private investment to “a halt”. While euro area investment remains well below its pre-crisis peak, US investment has been growing strongly ever since 2010 and now exceeds the pre-crisis levels. So, a one-step removed sort of explanation. By my reckoning the so-called sovereign debt crisis in the Eurozone was just a symptom of the flawed design of the Eurozone and the willingness of the monetary authority to selectively violate the Treaty provisions when it was ideologically consistent to do so. In other words, the ECB was quite willing in May 2010 to use its currency-issuing capacity to deal the private bond markets out of the game. The central bank quickly resolved the diverging Member State bond yield spreads (relative to the German bund) and when it did, under the aegis of the Securities Markets Program (SMP), the diverging yield spreads were quickly stabilised. In effect, the ECB was, via its secondary bond market purchases, acting as a fiscal agent, in lieu of such a authority being created under the Treaty of Maastricht. The problem was that the ECB went into partnership with the European Commission and the IMF (the so-called Troika) and in return for stabilising the bond yield spreads it insisted that Member States undertake pernicious austerity policies that undermined any prospect of economic growth. It wasn’t the diverging bond yield spreads that cause the problem, as the ECB author would like us to believe. Rather, it was the fiscal austerity that was imposed that caused the problem. There was no sovereign debt crisis in the Eurozone once the ECB indicated its intentions under the Securities Markets Program and its subsequent iterations. … the onset of the sovereign debt crisis, which tightened lending conditions in stressed countries, led to tighter fiscal policies and elevated uncertainty, which ultimately triggered a new euro area recession. Non-government credit in the so-called “stressed countries” was never going to recover quickly given the scale of the crisis. As explained above, the ECB dealt with the diverging bond yield spreads once said introduced the SMP. There was no sovereign debt crisis after that point as long as the ECB maintained that program. The so-called “tighter fiscal policies” (an understatement if there was ever one) were imposed as part of the enforcement mechanisms under the Stability and Growth Pact (SGP). While the SGP has historically been applied in an inconsistent way (remember the French and German let off in 2003), the imposition of austerity on nations such as Greece, Portugal, Spain in 2010 and onwards was not to protect private bond markets, but rather, to maintain the ideological hegemony of an intrinsically neo-liberal European Commission. The recession that followed was created by the austerity. Once the ECB demonstrated it could use its currency-issuing capacity to purchase any volumes and type of government debt if desired, the so-called ‘sovereign debt crisis’ became a non-issue. The ECB author also suggests that it is “the different developments in investment in construction” in the US and the Eurozone that help explain the different investment dynamics. While euro area non-construction investment has started to recover slowly in recent quarters, the dynamics of investment in construction eight years after the Great Recession, essentially remain flat. By contrast, US investment in construction started growing again at the beginning of 2011, although, as of the second quarter of 2016, it was still 10% below the level of the fourth quarter of 2007. An important reason for the faster recovery in US construction investment may be a faster rate of population growth. While that might be a factor, it is more likely that the austerity in the Eurozone meant that the households and firms found it harder to restructure their balance sheets (and reduce the excessive debt they built up in the pre-crisis period) than households and firms in the US who were enjoying income growth as a result of the retention of very large US fiscal deficits. The ECB author then seeks to absolve the austerity and the introduction of the euro from the story. He says that “the investment recovery roughly followed the same historical pattern of the previous three recoveries in the period from 1970 to 2007”. Meaning – the current period has nothing much to do with policy or a flawed Treaty. He produces a graph that is difficult to fathom. 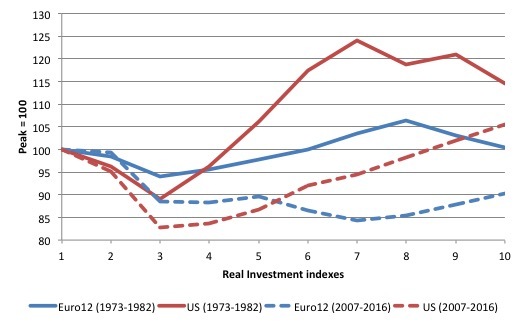 Here are two graphs that I have created and which show the behaviour of real GDP and real capital formation (investment) for the Euro 12 nations (the original Member States) across two different historical episodes. These historical episodes are distinguished by: (a) the conduct of fiscal policy; and (b) the introduction of the euro. The first graph shows real GDP indexes (indexed at 100 at the peaks) for the 1973 to 1982 period (solid lines) and the 2007 to 2016 period (dotted lines). The data is annual and taken from the AMECO database, which smooths out dynamics some what. The dated is assembled for the US and for the Eurozone 12 nations. The first episode only predates the introduction of the common currency. A further point to reflect upon is that the US had already moved to a flexible exchange by 1973, whereas the 12 European nations that went on (with others) to create the Eurozone, were hanging on desperately to the fixed exchange rate arrangements post the collapse of the Bretton Woods scheme in August 1971. I make this point to provide some separation in what might be driving the vastly different historical experiences shown in the two graphs. Within the Eurozone, the exchange rate arrangement is not a point of difference. 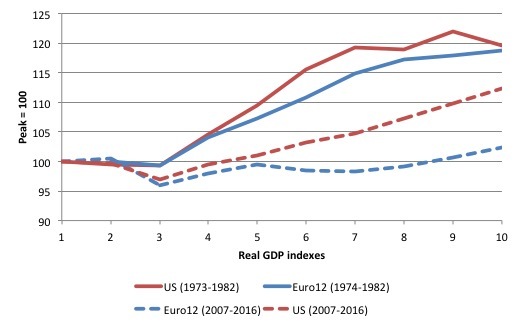 While the recovery for the Euro 12 nations from the 1974 downturn broadly followed the same pattern of the US, which went into recession somewhat earlier, the experience in the more recent period is markedly different. The fundamental difference is that the fiscal response during the GFC was quite different in the US compared to that of the Eurozone nations. While both initiated fiscal stimulus packages relatively early into the downturn, which placed them on a similar recovery path, the obsessive pursuit of fiscal austerity in the Eurozone created the divergence we observe in 2011, which then expanded in the following years. The second graph shows the patterns of private capital formation over the two periods. The ECB author is correct in his surmise that the European nations has had a poorer investment response historically when compared to the US. But it remains the fact that the current investment response is much weaker than the response that occurred in the 1973 recovery. Indeed, by 1982, investment in the Euro12 had grown by just 0.4 per cent on its 1973 peak. But, in the current episode, it is still 9.6 per cent below its 2007 peak, a much worse response. So the ECB author’s contention that “the current recovery has been stronger, with investment dynamics that were actually slightly above the historical norm” depends very much on how one constructs the norm. I prefer to compare particular cyclical episodes as above. That comparison shows how poor investment behaviour is in the Eurozone these days and I reject the ECB author’s contention that such behaviour is not the real problem in the Eurozone. … what is disappointing in terms of any historical comparison is the behaviour of aggregate consumption. His argument is convincing. The recovery of total consumption in the current period is very poor when compared to previous periods. But he doesn’t provide any explanation for that divergent behaviour. Here is another graph I produced using the annual AMECO database. It shows real private consumption expenditure (blue) and real government consumption expenditure (red) for the two periods discussed above. 1. Consumption behaviour in very different across the two cyclical episodes. Public consumption grew by 39.6 per cent in real terms between 1973 and 1982, while private consumption spending grew by 25.6 per cent. The cycle at the time was driven by the investment dynamics shown above. In the GFC and aftermath, public consumption has grown by only 9.2 per cent since 2007, while private consumption spending has grown by only 2.2 per cent. 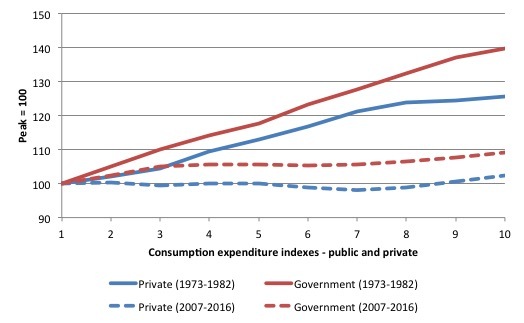 In the earlier period, governments expanded their consumption spending at a much faster rate than the private sector, in the early years of the slowdown. In the current episode, while private consumption spending was falling between 2007 and 2014, government consumption spending growth was tepid to say the least. In the first two years of the crisis, it grew by only 4.9 per cent and then the rate of growth stalled between 2010 and 2014. The damage was done by then. The current recovery in investment can only be sustained if aggregate consumption also grows at a sufficiently robust pace in parallel. Policymakers would be misguided to focus on investment exclusively. Instead, policies should aim for a broader recovery of aggregate demand and consumption in particular. The ECB’s current accommodative policy stance is therefore warranted, as it provides support for sustained growth in aggregate demand in a context where inflation remains too low compared to a level that is consistent with maintaining price stability over the medium term. My reading of the data – a glimpse of which I have provided above – suggests that both major components of private domestic demand (investment and consumption) are lagging well behind where they should be and where they have been historically after a real GDP downturn. I don’t think the ECB policy is doing anything to stimulate either component of aggregate spending. I think the Eurozone is being starved of confidence and hence private spending growth by the fiscal policy regime that the European Commission is dictating – as if it is mandated under the Treaty. The inconsistency of the Commission’s approach is highlighted by the way it has allowed Spain, for example, to grossly violate the fiscal rules to allow that nation to resume growth and offset political forces that would unseat the PP conservatives. The whole Eurozone reality is a mess and will not improve significantly until the Treaties are abandoned and currency sovereignty is restored to the Member States. The imposition of austerity is the defining feature of the current period – driven by ideology rather than economic logic. In fact, in economic terms, the policy response has been illogical and irresponsible. It must be so frustrating knowing very well how the European economies should be managed and watching the well paid monkeys in business suits in the ECB and their political masters create such a mess that seriously harms millions of people for years or even decades. The Eurozone is fundamentally flawed yet the monkeys cling onto it as they don’t know any better, or as mentioned the group think mentality stifles change or clear thought. I don’t know of any other profession like central bank economics where such gross incompetence is tolerated or not even noticed. The fact that easily workable solutions are available to ensure full employment and that these are also ignored must be equally frustrating. Bill how have they managed to keep the Euro so weak against the $ when they have huge trade surpluses? Is it because they cut the interest rates and did QE and the followers of Greg Mankiw made the portfolio managers sell Euros. I think if you look at central banks holdings of Euros they would have dropped significantly over that period. well how ridiculous is a situation where the yield on the greek debt for instance across the maturity structure is orders of magnitude above any growth that can be achieved given the austerity measures that are being asked for. Warren covers here as well.